Portland is home to some truly special places. Things happen in this town that simply don’t happen anywhere else. One example of this is Heaven’s Tea, run by “Tea Monk” Paul Rosenberg (he’s actually a Tea Master but far too modest to say so). Located at the base of Mt. 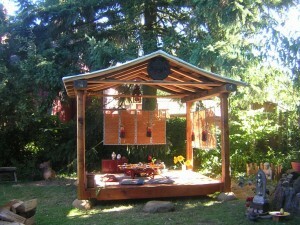 Tabor, Heaven’s Tea holds tea ceremonies in both an outdoor tea house as well as an attic tea space. Each location could easily be classified as a “sacred space”, adorned with ancient Tibetan art with design and construction work by some of Portland’s most talented artisans. Tea ceremonies are often accompanied by fresh cut flowers and local chocolates creating a truly remarkable environment. As majestic as the setting is, the tea ceremonies would be nothing without Paul Rosenberg, one of the foremost practitioners of the art of tea on the west coast. From 30 year Pu-erh to Phoenix Tea from 400 year old tea trees, you never know what Paul will pull out and serve at one of his tea sessions. Paul is a tea maestro and he brews and serves rare teas you simply can’t purchase anywhere else. The rare teas served at Heaven’s Tea have very a deep and profound impact on your state of being. If you’ve ever practiced yoga and felt yourself drift into another ‘space’, you’ll start to get an idea of what drinking tea with Paul is all about. If your image of tea involves ripping open a tea bag and plunging it into a cup of water, or a brightly colored iced bubble tea that you slurp through a fat straw, prepare to have your mind blown. Heaven’s Tea has a wide range of events every month, from tea classes to tastings, tea and meditation, and even private one-on-one tea sessions. This week I attended an evening event called “New Moon Tea and Poetry”. Sitting in the outdoor tea house with five other people, we sampled a wide range of rare teas, sipped sake, read and wrote poetry. Although I am a writer I tend to be a little shy when it comes to writing poetry, but the evening was so inspiring that the words just flowed. The journey is long and you have just begun. Heaven’s Tea offers a unique experience in both tea and getting in touch with the sacred spaces within all of us. Paul’s work is absolutely not denominational in any way and he tailors each session to the people in attendance. One thing is absolutely guaranteed: you’ll never forget the experience.